Walking in the Kidron Valley at the foot of the Mount of Olives in Jerusalem we come across the monumental rock carved Tomb of Zechariah son of Jehoiada the High Priest. Zechariah the priest, who lived in Jerusalem at the end of the 9th century BC, dared admonish Joash, king of Judah, for being unfaithful to YHWH and allowing Baal worship to be reintroduced into the Holy Temple in Jerusalem. King Joash apparently did not remember, or did not want to remember, the kindness Zechariah’s father – Jehoiada the High Priest – had shown him when he was an infant: Jehoiada saved Joash from his evil grandmother, Athaliah, daughter of of Ahab and Jezebel: After her son Ahaziah, king of Judea, was killed at Megiddo, she began killing her dead son’s children to assure her position as ruler over Judea! When Joash turned seven, Jehoiada the High Priest brought him out of hiding as the legitimate heir to the throne, descendant of the House of David, and anointed him king over Judea (see II Chronicles 22:11 & II Chronicles 24:21). 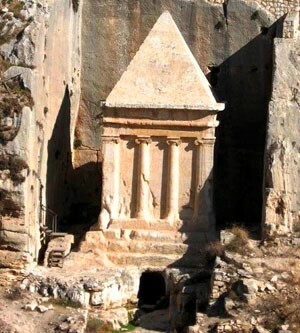 The the monumental rock carved tomb is from the 2nd century BC and has a pyramid shape, showing Egyptian influence. This entry was posted in Jerusalem and tagged Jehoiada, Jerusalem, Joash, Kidron Valley, Mount of Olives, Zechariah by zshavin. Bookmark the permalink.